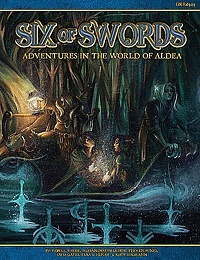 We have opened up pre-ordering for Six of Swords, an adventure anthology for Blue Rose: The AGE RPG of Romantic Fantasy. Pre-order the physical book through our Green Ronin Online Store, and we’ll offer you the PDF version for just $5 during checkout. If you’d rather support your local retailer, you can ask them to sign up for our GR Pre-Order Plus program. When you pre-order through a participating brick-and-mortar retailer, they will give you a coupon code so you can get the PDF from us for just $5. Six of Swords is an adventure anthology for Blue Rose. Set in the fantastic world of Aldea, these six adventures provide Narrators with ready-to-go scenarios for characters of various levels. They include ruined mansions, masquerade balls, vampiric curses, mysterious masks, sorcerous secrets, ghostly hauntings, lost loves, looming threats, and tragic quests where heroes are called upon to make the right choices. Six of Swords has hours of adventure, excitement, and entertainment for your Blue Rose game. The Kingdom of the Blue Rose needs heroes. Will you answer the call?